Piada is a delicious sandwich wrap that can be found almost on every street corner throughout Italy. You don’t need to go to Italy, though. You can make it at home; it’s so easy to make. I would describe Piada like a mix between Mexican Tortilla and Pita Bread. In a large mixing bowl, whisk together the flour, baking powder, and salt and olive oil. Make a well in the center of the mixture and pour in the water. Stir with a spatula until a shaggy dough is formed. It’s ok if not all the flour is absorbed in this point. Turn the dough out onto your counter and knead the dough for 8-10 minutes, until it forms a soft and uniform ball. Alternatively, you can knead the dough in a standing mixer with a dough hook on low speed for 5-8 minutes. Transfer the dough to an oiled bowl, cover, and let it rest for about 30 minutes. The dough can also be refrigerated for several days. When ready to cook, transfer the dough to your work surface and divide it into 6-8 pieces. Shape each piece of dough into a roll and cover. Set a cast iron skillet or griddle over medium-high heat. When the pan is hot enough that droplets of water sizzle as soon as they hit the surface, begin cooking the piadinas. Use a rolling pin to roll the first piada out as thin as possible, about 9 inches across and 1/8 inch thick. Roll it over the rolling pin or drop it over your palm, and quickly settle it in your pan. Prick the piadina all over with a fork to prevent it from puffing up. Cook for one minute on each side, or until you start seeing toasted brown spots all over the piadina. Transfer the cooked piadina to a clean dishtowel and cover with another dish towel to keep it warm. Continue preparing the rest of the piada as described above. Cooked piada are best when eaten right away, but will keep in a plastic bag on the counter for a few days. If you’re not planning to eat all the piada right away, it’s best to refrigerate the dough and bake the piada as you need them. 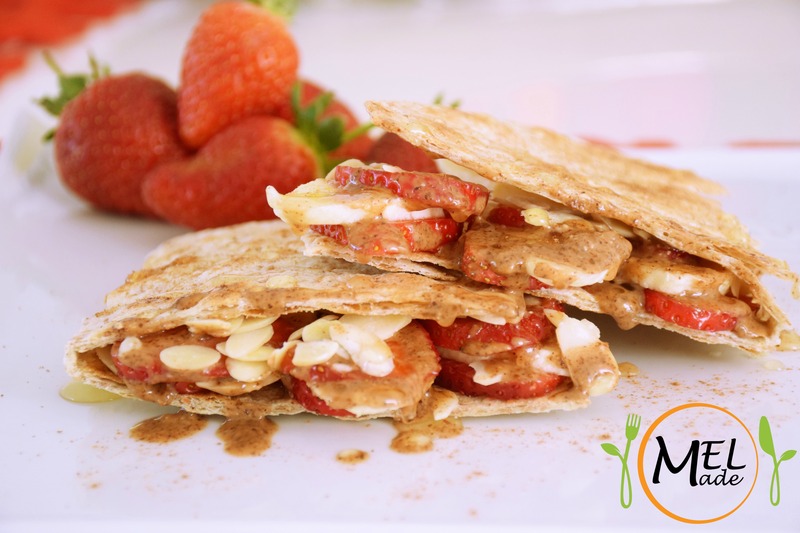 Slice the strawberries and the banana and put them all over the Piada, add the almond butter on top of them and sprinkle with the almond flakes and honey. You can use whatever fillings you like.